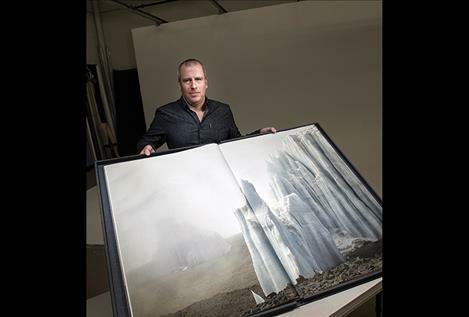 MSU photography professor Ian van Coller has focused his creative energy on making large- format, handmade art books about the melting of glaciers around the world to demonstrate the impact of climate change. He’s co-authored a book about the melting of glaciers in Glacier National Park that is now on display at the Metropolitan Museum of Art in New York City. BOZEMAN – Montana State University photography professor Ian van Coller’s efforts to shine a light on climate change have resulted in a series of art books documenting diminishing glaciers, including one that is on exhibit at New York City’s Metropolitan Museum of Art. Van Coller is one of three authors who collaborated to create “The Last Glacier,” which is on display at the museum’s Robert Wood Johnson Jr. Gallery through Feb. 5. The book, which is 25 inches by 40 inches when open, is composed of 13 woodcuts and 10 photographs that document the melting of glaciers in Glacier National Park. In addition to van Coller, other collaborators include Todd Anderson, a printmaking professor at Clemson University, and Bruce Crownover, a master printer at Tandem Press at the University of Wisconsin-Madison. The trio are friends and developed the concept for the book in 2012 while they were hiking to some of Glacier Park’s most remote glaciers, van Coller said. “It’s quite a hike to get to some of (the glaciers),” he said. Grinnell Glacier, for instance, is six miles from the nearest trailhead. For the next three summers, the trio returned to the park and took extended hiking trips of about 150 miles each summer and visited 18 of the 25 last remaining active glaciers in the park as they documented their decline. The artists chose 15 of those glaciers in the park to include in the large-scale art book. Van Coller, who teaches in MSU’s School of Film and Photography in the College of Arts and Architecture, photographed the landscapes with a high-resolution, medium-format digital camera and digitally stitched together huge panoramas that fit in the book. Anderson and Crownover returned to their studios and worked on large-scale reductive woodcuts, in which the negative space is carved out of huge blocks of wood and then hand-printed. The images were sequenced so that they illustrated what is happening to the glaciers chronologically. The Last Glacier Collective printed 15 books, working with a master bookmaker in Portland, Oregon, who hand-binds the book. Collectors of the book include the Library of Congress, Yale University, Stanford University, the Davis Museum at Wellesley College, the Jordan Schnitzer Family Foundation Collection, Clemson University, the University of Wisconsin-Madison and, of course, the Metropolitan Museum of Art, which also exhibits Picasso, Monet and Audubon. “To have (the book) selected for display is really huge for us,” van Coller said. He said that The Met, which has two million prints and photographs in its collection and just 300 of those on display at any one time for its thousands of daily visitors, is a large and prestigious audience for the book’s message about the impacts of climate change. Four of van Coller’s books are also included in a display currently at the Center for Books Arts in New York City. Van Coller’s documentation of glaciers and the impact of climate change has become his passion and has resulted in several creative projects. He has employed a similar large format and subject matter for five more books including the recent “Kilimanjaro: The Last Glacier.” That book is composed of large-format photos taken in 2016 in Tanzania and includes one woodcut by Anderson and a foreword by glacier scientist Douglas R. Hardy of the University of Massachusetts. Van Coller’s photographs show the African glaciers as well as the Tanzanian porters who hiked with him. One of those books has already been acquired by the Bill Bowes Art and Architecture Library Special Collections at Stanford University. Van Coller says he uses the large-format photographs because they provide unique archival records and objects that are collected by institutions. Van Coller has also made a large-format book on the glaciers of Iceland as well as a book on puffins. He is currently at work photographing glaciers and ice patches in Colorado’s Rocky Mountain National Park and would like to photograph glaciers in Antarctica and Canada’s Baffin Island. He has plans to photograph a tree called “Methuselah,” a 5,000-year-old bristlecone pine tree in California’s White Mountains that is thought to be the oldest non-clonal tree on the planet, meaning that its trunk is the same age as its root system. “I am busy for the next two years,” he said. And, speaking of time, van Coller said he is intensely aware that the time for photographing some of these natural phenomena across the globe is running out. He said to view first-hand the impact of climate change on the glaciers around the world has been sobering.